Among the most popular remodels are bathrooms. As styles and trends come and go, a bathroom can become outdated quickly, in need of a refresh. Whether you’re changing the bathroom hardware or doing a complete bathroom remodel for your client, ProSource® offers everything in bathroom sink faucets, showers, vanities, tubs, and toilets in our Sacramento showroom. Pieces and parts of the bathroom are becoming works of art, and a bathroom sink is no exception. 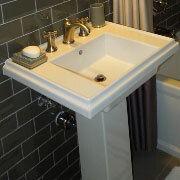 Find trendy sinks and beautiful sink designs at a cost-effective price point for you and your client. 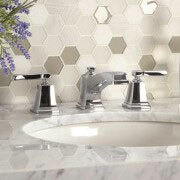 Sink faucets have also become a focal point in bathrooms, complementing the bathroom sink. Choose from stark, straight modern lines or classic, four-point knobs. We have a vast selection of faucets that will fit your client’s style and bathroom remodel budget. Everyone, including your client, wants to retreat to a relaxing warm shower, so finding one that is inviting yet functional is an important piece of the remodel. It’s helping your client figure out if they want shower doors or a shower curtain, and then, choosing the perfect shower head! Find a multitude of showers and shower parts in our showroom today. No matter how you remodel a space, the size never gets bigger, which is why bathroom storage is crucial. 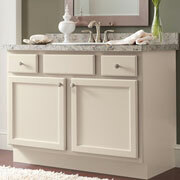 Find vanities in different heights and depths to store and de-clutter the bathroom. There are many bathtub options, so where do you and your client begin? There are soaking tubs that are stand-alone, or the best of both worlds with the shower/tub combo! 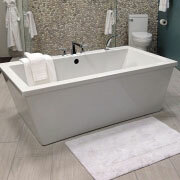 Explore our showroom for the best selection and prices in wholesale bathtubs. Toilets can often be overlooked as a part of the bathroom remodel, but perhaps it should be the focal point! After all, the use a toilet sees each day is probably the most of any other bathroom piece. Find eco-friendly toilets that use less water or a toilet with all the bells and whistles that flushes for you. 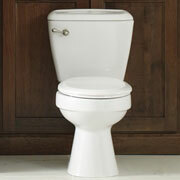 Update the toilet in the remodel and find all our models and available colors in our Sacramento showroom.